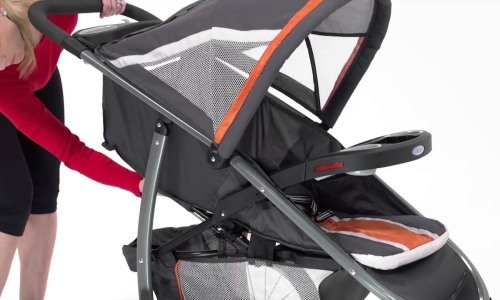 I have reviewed quite a lot of strollers recently, mostly the new models, but I have missed one of the bestsellers out there, the Graco FastAction Fold Jogger. Even though it’s not new on the market, it still gains a lot of popularity, and I don’t doubt it will continue to do so in 2019. 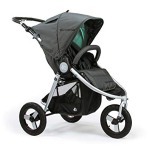 In general, there are some important aspects that made this stroller so critically-acclaimed. Right at a first glance you can tell that Graco listened to parents needs when designing this stroller. It’s meant to be a jogging stroller, but also one that you can use while shopping. 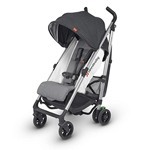 It comes as a combo of a stroller and a baby car seat to provide you with everything you need to go out and explore the world with your little one, while taking care of your fitness. Another, highly important thing is the fact, that the price of this one is really attractive, so it may be quite a bargain for those with low budget. Let’s take a look at the most important features of the Graco FastAction Fold Jogger to see if it may be the right choice for you. 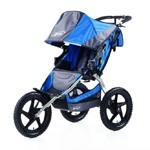 Jogging stroller 42″ H x 40″ L x 24″ W Graco FastAction Fold is a great jogging stroller for a low price, that offers very good maneuverability and easy folding. It also includes Graco baby car seat. First surprise: The Graco FastAction Fold Jogger is comes with the Graco Snug Ride Click Connect 35 Infant Car Seat included. It’s not often to see an included baby car seat, especially for such a low price. The car seat may accomodate an infant from 4 to 35 lbs. Such a combo is surely one of the reasons why this stroller has become so popular among parents. Guys behind Graco came with another great idea – you don’t have to remove the toddler seat to attach the baby car seat and quickly transform this one into a travel system. 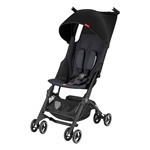 The baby car seat just connects to the stroller seamlessly. Another great thing here is you’re getting a full set, that doesn’t require getting any additional adapters that usually cost quite a few bucks extra. Thumbs up. The first thing that surprised me about this stroller was the ease of assembly. Usually it requires some time to get through the manual, grab some tools (included or not) and a bit of time. This time it was completely different. I’m not a DIY fan and that says it all about my manual skills. Still, I was able to make this stroller ready to go within minutes and it didn’t require to use any tools. Painless and quick. Wow (especially in my case). It wasn’t the end of surprises. I really like to see any stroller being able to fold with just one hand. I’m not being a picky princess, there are many that are able to do that and I have to admit that Graco FastAction Fold Jogger gets the top grade from me for this too. You can easily hold your baby with one hand and fold the stroller down with the other one in a single step. Just like that. I’ve had my hands on many strollers and I have to admit there are so many much more expensive strollers that just can’t keep up with the Graco FastAction Fold Jogger when it comes to folding. And there’s more to it, like I wasn’t surprised enough already. The Graco FastAction Fold Jogger locks automatically when you fold it, but that’s not something really rare. The thing I love is the kickstand. Thanks to this, the stroller stands up on its own really nice, and I can’t imagine the possibility that it will fall. I’ve noticed that when I’ve folded it for the first time and tried to lean it against the wall. Nah, Lindsey, said the stroller. I’m ok with that. 🙂 Folding process conclusion: easy, simple, one-handed. Nothing more to needs to be said here. Great job, Graco. I have expected that the seat will be really poor, taking the price into consideration. That’s not the case here. Naturally, you can see the fabric and materials used for the seat can’t stand up in line with the most luxurious strollers you can find out there, but it’s quite obvious and I wasn’t expecting them to be. Still, I thought they will be harsh and won’t provide comfort to the little passenger. Quite a surprise again for such a price tag. 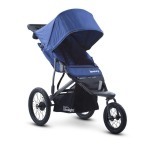 Interested in purchasing Graco FastAction Fold Jogger? Check how much it costs on Amazon and see if there are any discounts available. 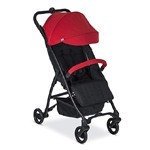 The seat will make your baby happy, as it is nicely padded with plush fabric. 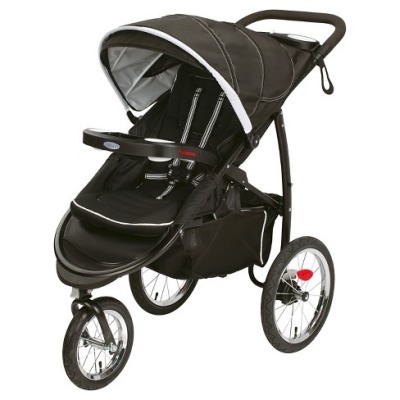 Again – in fact there are some more expensive strollers that have less comfy seats than the one found in Graco FastAction Fold Jogger. The padding found here will not only provide comfort for your little one, but also cushion the passenger a bit when you go through some bumps or rough terrain. The seat has a multi-position recline, another thing that allows it to keep up with more expensive competition. Whatever the situation is, you can put it straight up if you want to show the surroundings of the world (in fast forward mode when running, but kids love it!) or pull it back to a nearly flat position if your little one has seen enough already and needs to take nap. I always say – safety first, so let’s take a look how does Graco FastAction Fold Jogger deal with this. I can’t already recall how many times this stroller has surprised me. We have a convertible three- or five-point harness here that will keep your kid safe and sound in place. The option to make it a three- or five-point one will be highly useful in time, as bigger kids usually don’t like five-point harnesses. The harness may be easily adjusted as your little one grows. 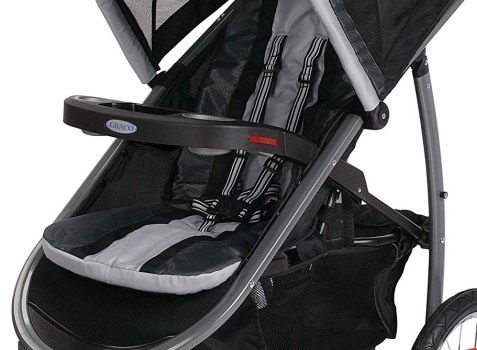 Something extra I’ve noticed as a paranoid mom – Graco has put reflectors on the stroller to provide the visibility of you and your baby in low lights. Thumbs up from me for this one. It’s all about a smooth riding experience after all, isn’t it? Let’s see if the Graco FastAction Fold manages to surprise one more time. We’ve got three wheels, as usual in a jogger. The tires are air-filled and the wheels are quite alike bicycle ones – the front one has a 12 inch diameter and two rear ones are 16 inch, pretty big. 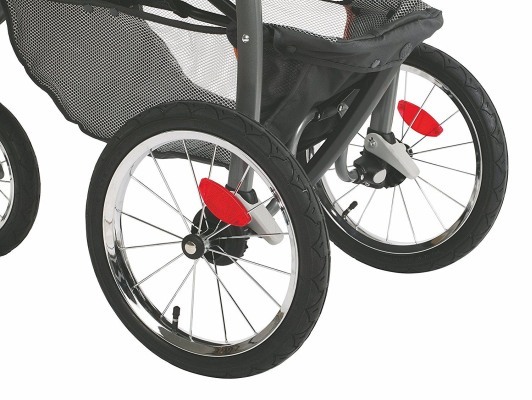 The front wheel comes with a suspension system to cushion your little passenger while you go through some harder terrain and even it’s not an all-terrain stroller, thanks to the fact that the wheels are air-filled and pretty big, it will also handle some harder terrain like gravel or get you through higher curbs without a problem. 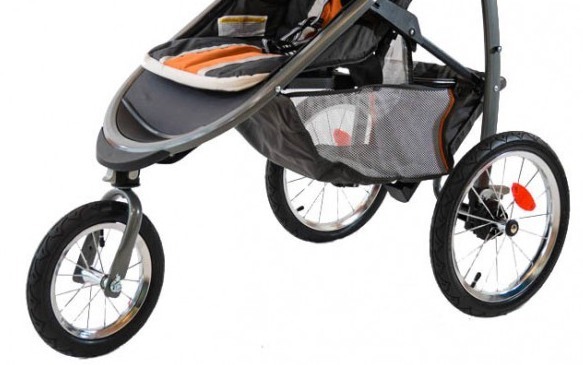 You can easily set this stroller to jogging mode, as the swivel front wheel has the locking feature to keep the stroller in straight line while you’re running. Release the lock and the Graco will be able to turn without a problem in tight corners or get you through a mall or a crowded street. Overall the maneuverability is more than satisfying, pushing or pulling is really easy. Thumbs up, again. 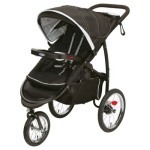 Wondering if getting Graco FastAction Fold Jogger is a good choice? Check what others think about it, read the reviews at Amazon. Finally, I’ve found something that could use some improvement. It’s the braking system. The Graco FastAction Fold has two separate brakes found on the rear wheels. They will be rather hard to use with flip-flops (but you don’t really go jogging in flip-flops, on the other hand) and need to be activated separately to pull the strollert to a complete stop. It would be easier if there was some kind of a bar connecting the two brakes as it is found in many other strollers. Still, to be honest, it’s just a matter of time and getting used to the braking system, as it does it job the way it should. After all, you don’t use the brakes as often as you do while driving a car, so it’s not a biggie. One more plus for the Graco FastAction Fold (it’s getting boring already). The storage basket found beneath the seat is really spacy and will fit anything you can usually need during a stroll, like a big-size diaper bag, toys, snacks, or baby food. Even a set of extra clothes for you if you’d like to change after jogging and hit the city straight away. I have to admit it’s also easily accessible, and that’s an important thing. Another thing included with the stroller (or actually more like built-in) is a great parent tray to fit your phone and a covered comparment for all your other essentials like wallet or keys. Not enough? It also has two cupholders. Your little passenger also gets his own tray that will hold two more cups and additionally works like a belly bar. It may be easily removed for cleaning. There are also storage pockets found in the seats. All these possibilities make me running out of ideas of what should I put in there. I’m not really sure if I’m actually reviewing a budget stroller. 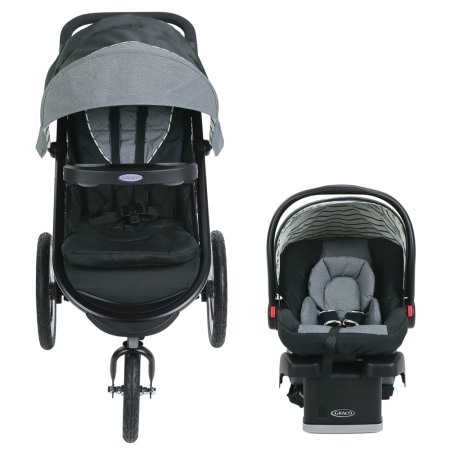 Without a doubt, for a jogging stroller that costs less than $200, Graco FastAction Fold provides way more features than I’ve seen in so many much more expensive strollers. I understand why so many parents have called it an ultimate crossover that will serve you and your kid in almost any situation. If you want to go jogging? No problem. Longer stroll around the city and some shopping? You’re good to go. Distant destination, car trip? Sure thing, just convert it into a travel system easily, and the baby car seat is included. 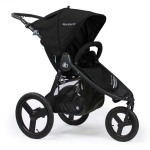 There are some downsides, like the brake, but overall there are just a few cons, while the pros are quite an impressive list, so this stroller is a great choice for such a low price.